Corallus caninus is an arboreal boa species. They have highly developed front teeth that are likely proportionately larger than those of any other non-venomous snake. The color pattern typically consists of an emerald green ground color with a white irregular interrupted zigzag stripe or so-called ‘lightning bolts’ down the back and a yellow belly. 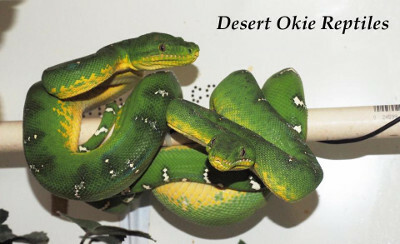 Juveniles vary in color between various shades of light and dark orange or brick-red before ontogenetic coloration sets in and the animals turn emerald green. There are 3 things of paramount importance when it comes to housing ETBs: temperature, air flow, and humidity. Personally I feel tub-housing for animals 2 years old and older make it the most difficult to achieve what they require. Neonates-1 year do well in tubs. A gridwork of suitable perches over a water bowl with the tub kept as spartan as possible works best until feeding trials are over and the animal is feeding on a regular basis. 2 years old to adulthood is the time to move animals to more permanent enclosures. For non-breeding females and males up to 6’ (which is typically only the largest females) a 2’ square PVC cage is all that’s required. Here is where a lot of keepers make a mistake: perch size. Perch diameter should always be much smaller than the girth of the snake would visually indicate. For my largest, most robust adults I don’t provide anything larger that 7/8” diameter. I typically offer parallel perches of different diameters at the same heights (temp. gradient) and let them choose what they prefer. I’ll then later remove the ones they don’t utilize and replace them with more of the desired diameter perches. It is my personal belief we should set up our animals with a wide array of options regarding perches, hides (where applicable), temps, and humidity and let them decide what they want. Let THEM choose, offer more of it, and then leave them alone! The human brain has a tendency to invent “issues”……if we stare long enough our mind will convince us something is wrong and needs to be tweaked….which leads to intrusions into the cage which equals stress! Large or multiple small lateral vents are needed to ensure proper airflow and I run 2 large fans in my bldg. 24/7 to keep the air constantly moving. Nothing is static in nature, temps, humidity, air flow are all daily variables they’ve evolved to live in/with and expect. Portions of the perches should be “walled-in” with fake or real plants to provide the animal with a sense of security. ETBs don’t habituate bare branches that are open and exposed in their habitat, this is even more important when digesting food. Cypress mulch or Orchid bark are my preferred materials as they hold humidity well and seem to be much more mold resistant. At the age of up to 1 year old ambient heat of 29 °C (84 °F) is all that is needed, with no specific “hot spot” needed. A good thermostat is required. Probe affixed to a perch directly underneath the heat panel set at 29 °C (84 °F) is what I use. The cage itself should be large enough and have enough perches at various heights to allow the animal to move into various heat ranges. Optimally the ability to choose between 26-29 °C (79-84 °F) is a good set-up. 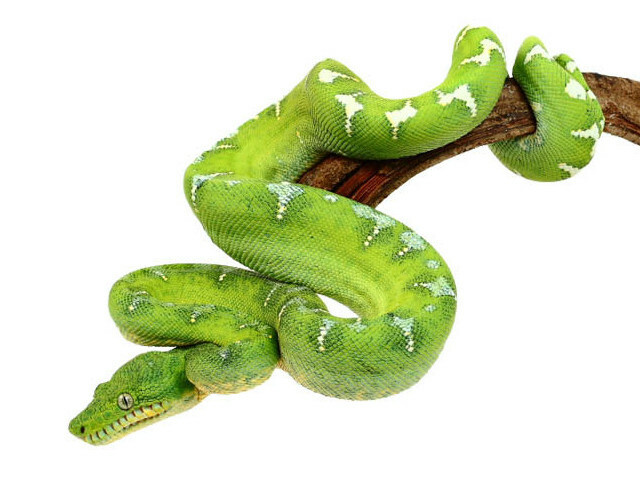 If you are planning to breed Corallus caninus it’s not just the temp drop with Boas, BUT the drop in addition to shorter and shorter light cycles. These are the only two triggers I employ; don’t manipulate humidity variables much if at all. What you’re after is progressively longer, cooler nights followed by shorter, warmer days. The “warm” part of each day should become shorter and shorter. Say your “day” starts at a 12/12 ratio and ambients are 28 °C (83 °F). Drop the DTH from say 28 °C (83 °F) to 26 °C (79 °F), the night drop to 24 °C (75 °F) and the ratio is changed to 14/10 (night/day). BUT, the heat is on for only 8 out the 10 hours! Do this for 2 weeks. Then drop the ration to 15/9 (night/day), 25->22°C (77->72 °F), with the heat on for only 5/9 day time hours. Hold this period for 2-3 weeks. “Peak” at 16/8 (night/day), 24->21 °C (75-69 °F), with heat still on for the 5 hours. A lot of guys don’t drop that low but I’ve had zero issues. I let them sit at these coldest temps for 7-10 days only. Then reverse in the same gradients/ratios. A water bowl covering 40% of the bottom of a cage is needed as it will provide additional overall humidity. I’ve never had an ETB that wouldn’t drink from a bowl on the ground and don’t offer elevated water bowls in my cages. Fresh water is very important! They seem to drink more readily from fresh water. I mist my animals once/week which spikes humidity at 70% and allow the cage to dry out over the course of the week to about 40%. ETBs are NOT Chondros, they reside up in, and above the jungle canopy where it is far less humid, cooler, and breezier than below the canopy. ETBs have a slow metabolism. Large items fed too often can lead to regurgitation issues….which is a topic for another paper entirely! Always feed smaller items than the length/girth of the snake would visually dictate. For example, my enormous 1.8 meters (6 feet) females never get anything larger than a retired-breeder mouse sized item. I vary and rotate between these, similarly sized rats, African Soft Furred Rats, and day-old chicks. I feed every 2 weeks. I don’t handle my ETBs, in fact I don’t handle any animals in my collection unless absolutely necessary. Just my personal philosophy…..even if an animal doesn’t bite or vent when handled doesn’t mean it’s not stressed…it is. It’s unnatural for them! My goal is breeding, if I get them to breed successfully and recover well afterwards then all the husbandry before and after that point must be good! Water bowls should be cleaned/changed every 2-3 days. Spot clean the enclosure when necessary. As long as relative humidity is above 40% ambient with weekly spikes after spraying at around 70% Emeralds will have no shedding issues. In the even of a partial shed an hour-long soak in a tub of lukewarm water will allow for a quick hand shedding. This can be simple or a delicate task depending upon the temperament of the animal in question. REGURGITATION! Purely and simply THE biggest concern when keeping caninus! The details of which (pathogens involved, etc.) are still being researched and are still somewhat speculative. Wild caught/imported animals are the ones that most often demonstrate this issue and should be the basis of an entirely different paper. MANY scientific articles have been written about this topic and any interested parties should do a web search for Emerald Regurgitation Syndrome to read further. With captive bred animals the recipe to reduce the instance of regurgitation is fairly simple, feed small items (much smaller than the length/girth of the animal would otherwise dictate), feed sparingly (every 2 weeks) do not feed multiple items in a feeding, and keep the warmest part of the cage no hotter than 29.5 °C (85 °F) with a large enough cage for them to find cooler temps. to move to to digest. This author, for example feeds even the largest adult caninus nothing bigger than a jumbo mouse, day old chick, or equivalently-sized rat. And only one per feeding. Upper Respiratory Issues : Emeralds can and will get UR issues if kept too cool and damp with poor air circulation. As noted in the Caging section, a cage big enough for them to access a range of temperatures from 26-29 °C (79-84 °F), fluctuating humidity, and ample ventilation will greatly reduce the chances of their immune systems being compromised to the levels that allow for bacterial infections to develop.